FRIDAY HARBOR, Wash. – A new “whale warning flag” will be flown by boats and select land stations along the west side of San Juan Island starting this weekend to let boaters know whales are in the area. KCPQ-TV reported that according to the National Oceanic and Atmospheric Administration, the yellow and red flags featuring a black whale tail are part of new San Juan County initiatives to increase protection of endangered Southern Resident orcas. Studies have shown that boat noise impacts Southern Resident orcas trying to eat, and whale advocates hope the flag will get people to be more cautious. 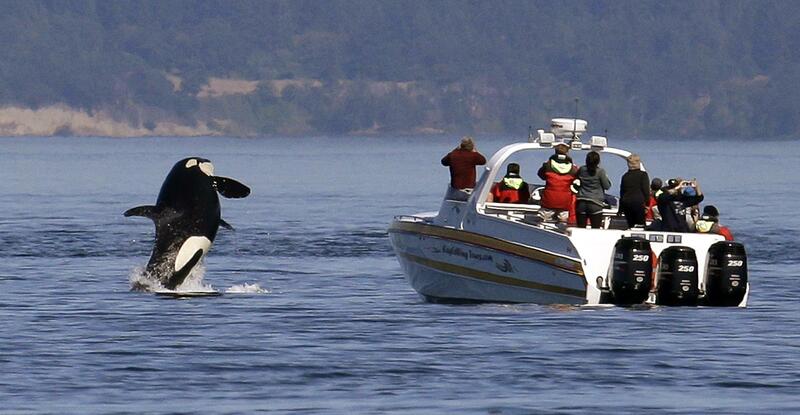 Other guidelines call for whale-watching vessels to stay farther away from certain areas. The Washington department of Fish and Wildlife is asking for recreational boaters to do the same. Earlier this year, Gov. Jay Inslee signed an executive order for increased protection of the Southern Resident. Published: May 26, 2018, 9:32 a.m.